Nestled on the edge of the Brecon Beacons alongside the River Usk, is a "little piece of magic" that has more than just its residents under a spell. Now its thriving high street and community spirit has seen it named the Best Place to Live in Wales, according to the Sunday Times. 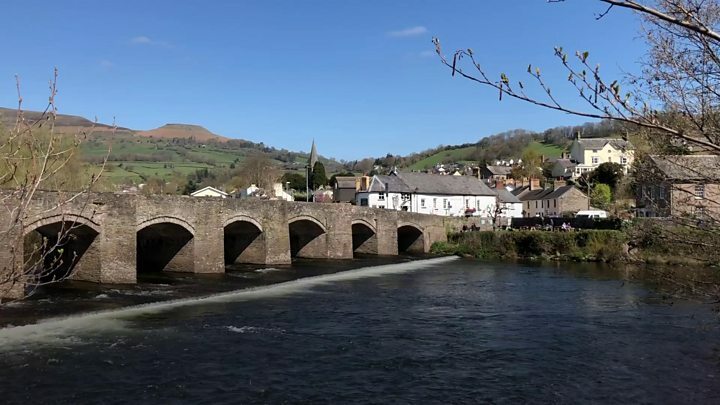 Strolling across its historic bridge and along the High Street - recently named the best in Britain - it is easy to see what makes Crickhowell special. But residents were already well aware of the town's "uniqueness, beauty and community spirit" and are even growing used to the town's growing fame. "There are beautiful villages everywhere but there's something unique about Crickhowell," he said. "The residents and tourists come together, it's a little bit of magic." One of the leading figures behind the success of the High Street is the owner of the recently crowned best book shop in Wales - Book Ish. Emma Corfield-Walters said: "It's all about the community, people take time to talk to each other here. "Businesses work together, rather than compete, to make sure we all succeed. "I work with about 34 other local suppliers, all delivering local produce, and other businesses have the same ethos. "We are in a little bubble here - Crickhowell is almost self-sufficient. "But this is not a new thing where people have jumped on the bandwagon. There are shops that have been in the same family for generations." Stephanie James, 32, said the High Street helped give it a "uniquely independent" feel. "There's a wonderful independent feel to the town with all the shops and everyone stops to chat. I love the scenery around us - it's beautiful." However it is not just the high street - judges assessed a range of factors, including employment, schools, house prices and community spirit. Florist Debbie Davies, who owns Petals, said residents were "proud" of the town. "It's hard to put into words because it's just a feeling you have living here. It's a small town with a big heart," she added. Josh Cashell, 22, who works in the family-run butcher, loves walking in the surrounding countryside and the town's many pubs. "It's a small town but because it's such a safe place to grow up, kids can make their own fun in the fields," he said. "I think people are proud to be from here." Locations in south Wales dominate this year's selection, thanks to new entries Chepstow and Carmarthen, featured for the first time. Last year's Welsh winner was Mumbles in Swansea, which remains in the top 10 along with St Davids in Pembrokeshire. North Wales is represented by a new entry, the fishing village of Aberdyfi, where two-bedroom Victorian fisherman's cottages off the seafront start at £200,000. Helen Davies, Sunday Times home editor, said: "This year we were looking for community spirit along with convenience and culture. There are so many great places that the choice was a hard one."